One toy top of many children's wish lists this christmas is the Furby Connect. 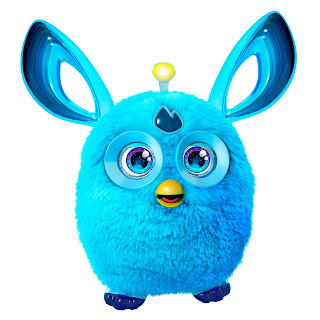 Yes, that's right Furbies are back and today I am giving you the chance to win one in your colour of choice: pink or blue! 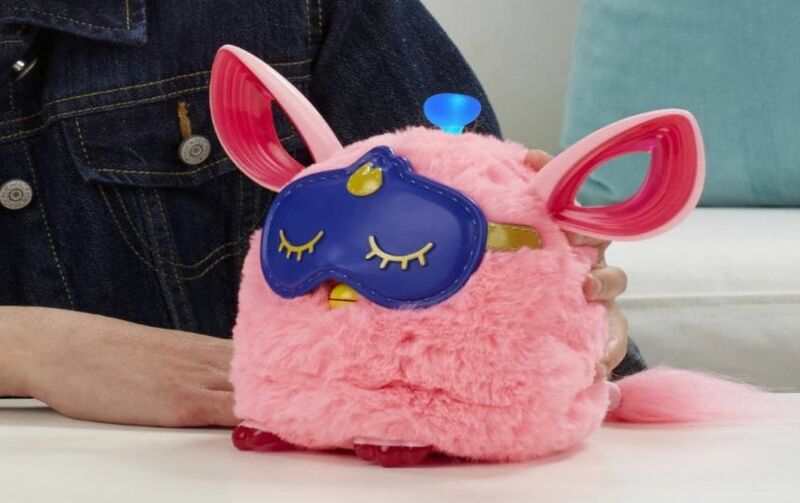 Furby Connect comes in a variety of colours (including pink, purple, blue and teal) and it’s fur is lovely and soft! The new Furby learns, responds and changes personality as you play together. If you hug and tickle it, you might end up with a total sweetheart. But if you shake, flip or pull Furby’s tail, you might end up with a cheeky little imp on your hands! 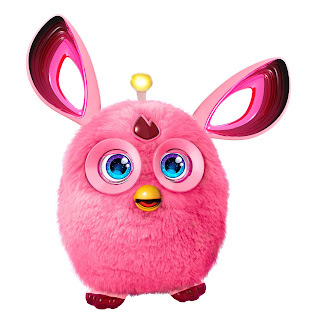 With animated LED eyes and a lovable voice, you’ll know just how Furby feels. Furby speaks Furbish but will pick up English too as you communicate. Also, if you put more than one Furby together, they’ll joke, flirt, dance and sing amongst themselves! This time around there’s also a free app to download for your iPhone, iPad or iPod Touch so you can feed Furby, create new meals and translate what the little guy says. You can even teach yourself to speak Furbish! Watch the video below to see the Furby in action! Furbies are on sale for £64.99 at Amazon (usually £99.99) but do keep an eye out for sales in the run up to Christmas. For a chance to win one, enter the rafflecopter below and tell us why you deserve to be chosen to give Furby a new home. The more entries you complete the better chance of winning. Good luck! My little girl would take great care of this little furby if you chose me as a winner. I think she would call her furby Pixie or Pete! I would become the best ever auntie to my niece who tells everyone she sees how much she wants a Furby for Christmas and she will be called Fiona the Furby. It would really make her Christmas, thanks. I would be the best godmother ever because all she seems to talk about is furby's and "allllll" her friends have them so she wants one too! She would call it sally but the name seems to change on a weekly basis so who knows what she'll have decided on if she were to actually get one!! Because my niece doesn't have one but her two brothers do! She'd name her Penny after her favourite character in Fireman Sam. PS - I have no clue how the secret word page works. I just have three adverts and nothing is revealed when I click on them. Am I being stupid???? I'm using chrome. My daughter would love to give a Furby a new home. I deserve one as I can remember having one as a child, and the torture it caused my mum. Now that I am a mother I would love for my daughter to get the joy of a Furby especially as they have improved so much over the years. My daughter would be likely to call the Furby something like Sophie. My boys deserves a furby because he barely asks for any presents but I've noticed him eyeing these up in the shop! Because I wouldn't keep little pink 'Fuzzy' (That's the name I would choose :-), my granddaughter would be choosing her own name). She loves to mother little creatures. These are on my daughters Christmas list, she would call it Fluffy apparently! I would love to win the blue one for my grandson, he would absolutely love it... so would I lol being a big kid, I remember getting them for my daughter when she was young. I would love the Blue one for my little Grandson, he would love it! I deserve to win because it's a random draw and my name came up. I would love to win this for my daughter, I think it would be something that she could really fall in love with as I did my furby. I don't deserve it any more than anyone else. I would give it to my niece so not sure what it would get called. Because I love furbies and have two of the original furbies when they firstly came out! My kids would love to share one of these. We would call it Marshmallow. Both of my girls would love this and would give it a fantastic home. My son has seen these and would love one to play with and look after. I have no idea what he would call it; I would hope something cute like fluffy but I doubt it! My son is desperate for a pet but we can't afford one at the moment. He would probably name it Freddy Furby. I'd love the Furby for my niece who loves all animals and at 3 yrs old tells everyone she is going to be a vet. She would love a real pet but is not allowed one until she is older and the Furby would be a loved replacement. I think she would call her Molly after the little girl in her favourite book. My little boy would give him a much-loved home, blue bob shall be his name! I don't deserve to win any more than anyone else, but I loved my furby when I was little and I would like my son to have the same fun. My daughter has the older version furby and still loves to play with it. I'd love to be able to give the new one...she would adore it! She would probably call it Furby to be honest. Lyla has excelled at sport this year & has worked so hard at school even though she is dyslexic! I'd call the pink furby Pinky ! My daughter is dying to get hold of one of these. It's at the the top of her wishlist. She would love a pink one and would call her Daisy. My son Christmas list is manly a list of unusual pets, hippopotamus, pigs, turkeys, however Furby has made it this year. He has wanted a Furby for a couple of years, I did get my niece a few years ago. He says he is ready to look after his own one now. I would love to win for my two youngest daughters Lexi-Rai and Lyra-Mai. I know they would look after him/her and would be over the moon to be a furby mommy. My little girl has asked for nothing else this Xmas!! She's keeping her little fingers crossed for a furby!! Would be over the moon to win her one!! I've always wanted a Furby - ever since they first came out. And now my daughter wants one too. I think between the two of us he would have a lovely home and be very well loved. I would love to win the kids one, they have been asking for one, but I tried to be organised this year and already have most of the Christmas shopping done, so only way they are going to get one is if I win it or get a great deal. As my daughter has a stuffed lion called tiger, he could be called anything! Perhaps giraffe, lol. My children would adore to have a furby and make him part of the family. I think he'd bring us all a lot of fun and entertainment and I'd let the children choose his name. My son would love to make the Furby apart of our family life, he will have a magical time here! I would share it with my daughter, I had a furby as a child and loved it. I would call my furby Candy! It would go to good home and be well looked after.Feed well and no baths after midnight lol #Gremlins, We will call it Gizmo! My son would love it! He loves animal and monster toys. We always let him name them, so it's very random what it could be! My litle girl has been tidying her room every day since these furbys came out in the hope santa sees and rewards her with one for christmas! it would make a little girls dream come true! I think that my great niece is deserving to win this Furby as her family have been going through some very difficult times recently. Her mom is in hospital after an emergency op to remove her spleen, and things are very tight financially too. She would call her furby Zoe. I would love to win for my little granddaughter who is desperate for one. We would name it Bob after our hamster . She would name it Edo because she names everything Edo lol. I would like one because I have been collecting them for a while now and I have 38 furby things. I've wanted a furby connect since they have been out! I don't deserve too win one more than the next person.But I know my 3 kiddies would love one.I think they would name him Oscar her poppy. My nephew would love to have a furby, it would be like his best friend and i think he would call him Frankie. I deserve to win as this would be a lovely treat for my daughter. She is mostly always a good girl and never complains when I ask her to get ready for school or to do something. We would call our furby Freya. We would promise to look after Furby Frankie or Florence. He or she would teach us how to look after something else and how to share nicely. My son would love one of these as he hasn't got a pet so it would be like a pet for him! I would leave the naming up to him! Would love one for my friends little boy who REALLY wants one. We would call it Fuzzball! my daughter would love one, she would probably call it something like fluffy! My daughter and my son have been whining about wanting a new baby and/or a pet...I think a furby might be the closest to their dream. they'd call it Furby!! My two kids would never tire of him and they will probably call him Kaiser. this has been at the top of my daughters xmas this year, all she has said is that she wants a pink furby, she has been playing the app and is rarely off it! My nephew would call him Dewi as that's what he's been calling his much wish for Furby all year!! It would stop arguments between my Grandchildren as we have an old style Furby that they both want off my son (their uncle). I would let my Grandaughter choose the name although she calls everything kitty! Soft and great fun. I know this will be loved for ever!